HFIA teamed up with the USDA Forest Service Pacific Northwest (PNW) Research Station and the Northern Research Station and University of Hawai‘i to implement the Young-Growth Koa Wood Quality Assessment and Demonstration project. Others involved include Kamehameha Schools, Department of Hawaiian Home Lands, and Parker Ranch. HFIA contracted with subcontractors to harvest and mill the project trees. 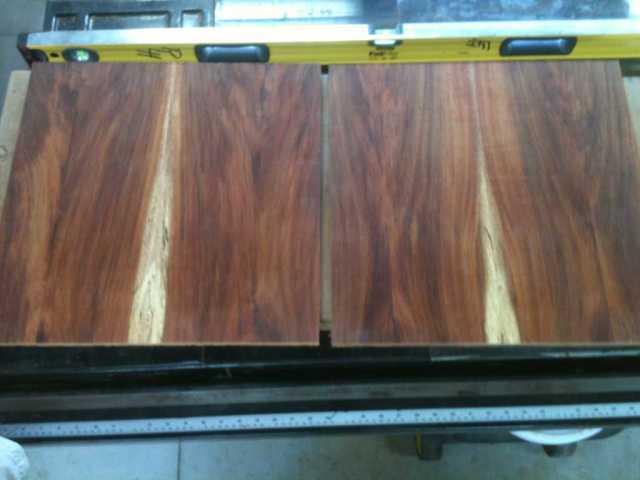 To address questions about the viability of young-growth koa in existing koa wood product markets, a study was conducted in which 10 young-growth koa trees were harvested at three locations on the Island of Hawai‘i; Keauhou in West Hawai‘i and Waipunalie and Humu‘ula in East Hawai‘i. Results will provide a good indication of the variability of the young-growth koa resource on these key attributes. 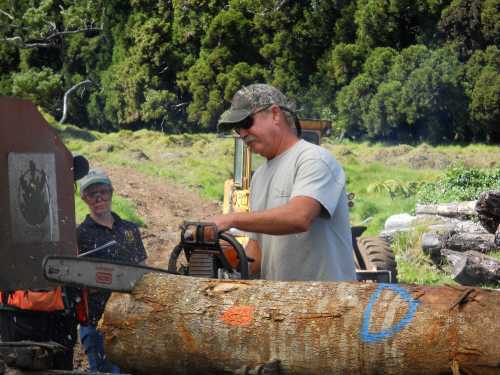 A Young-Growth Koa Wood Processing Demonstration Day was held on November 15th at Jay Warner’s mill in Waipunalei. Jay milled one log from each of the three sites, explained the milling process, and answered questions from the 25 attendees. US Forest Service Reserchers Jan Weidenbeck and Eini Lowell and research assistants Betsy Porterfield and Judy Makowski collected data from the young-growth koa wood for important market attributes such as color, heartwood/sapwood proportions, defect, wood density, and curl figure. UH Extension Forester Dr. J.B. Friday and his assistants Holli Tidwell and Sarah Knox assisted with the study. Merchantable log sections were measured, analyzed for defect, photographed, and then sawn. 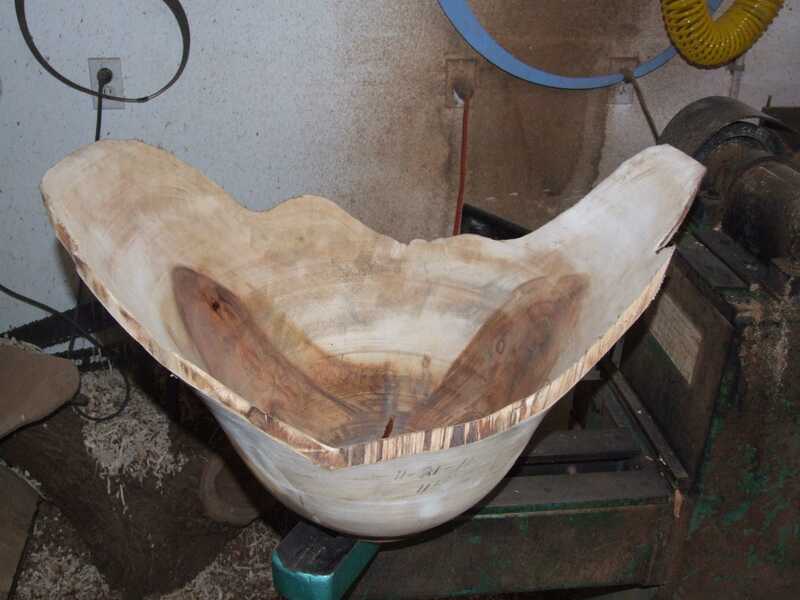 Six HFIA member woodworkers will be creating pieces from the young-growth koa wood. 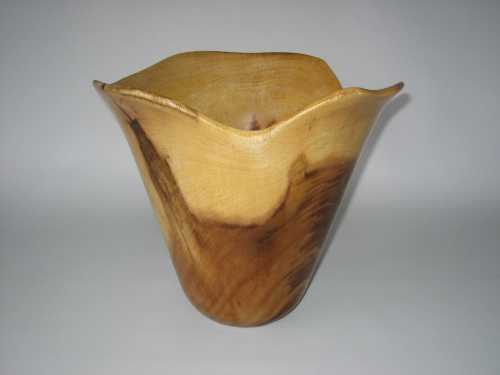 The pieces will be displayed for up to one year at public venues, including the 2012 and 2013 Hawaii’s Woodshows. Because this is young koa, this will be an interesting challenge. The element of design and craftsmanship will be very important. Dave Landry's UH Manoa summer furniture art studio class crafted beautiful pieces of furniture from our young koa. 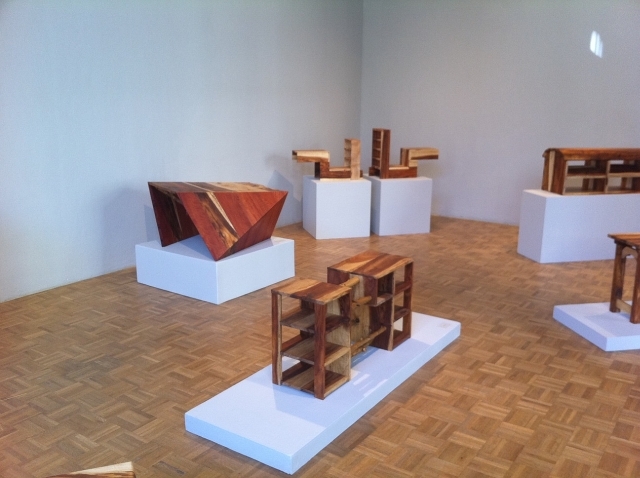 The pieces were on display at the UH Art Gallery in September 2012. The pieces are between traditional and contemporary, functional and sculptural. See more photos of these pieces crafted by the talented UH students at UH Manoa Students' Young-growth Koa Furniture. Jay Warner cuts a log on Demonstration Day. 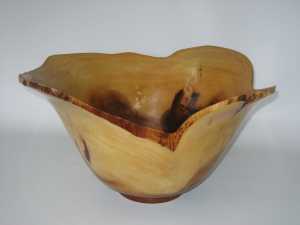 Don Albrecht's rough turned koa bowl from young-growth koa wood. 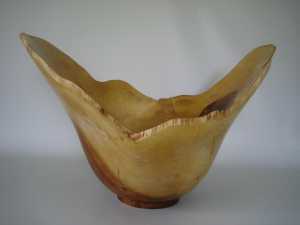 Don Albrecht's bowl, which was displayed at the 2012 Hawaii's Woodshow. 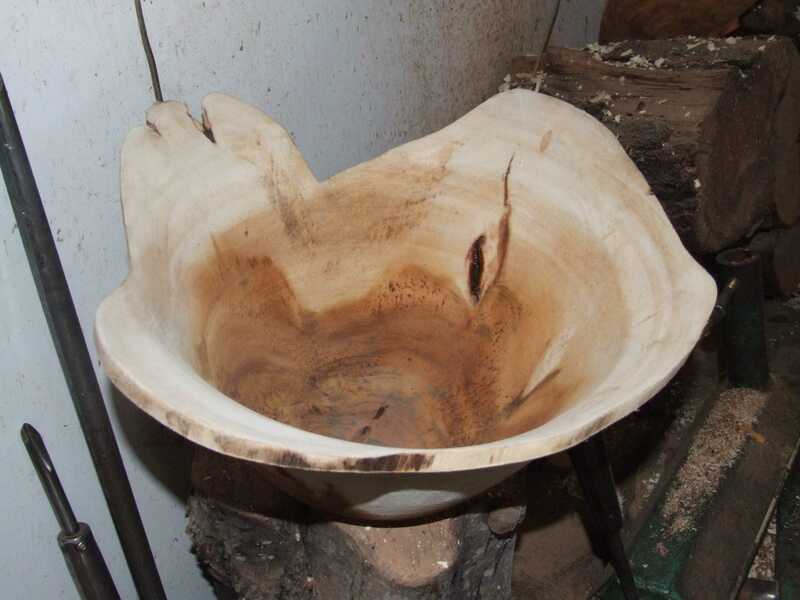 Don Albrecht's bowl, which was displayed at the 2012 Hawaii's Woodshow. The bowl is now on display in HFIA's Hilo Airport Display. Ron Hester’s matched set of small end tables in process. The end tables are Ron’s interpretation of a classic Hepplewhite design. UH Manoa students' furniture crafted with young-growth koa. 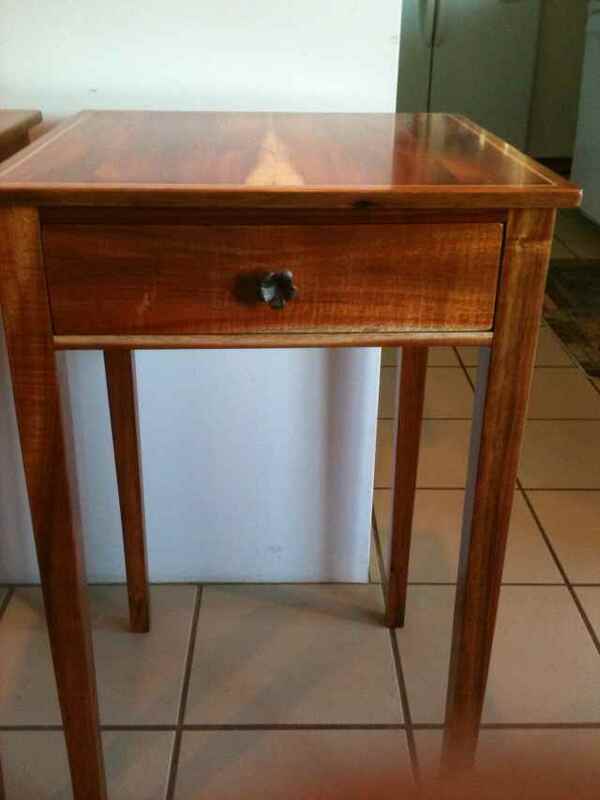 Ron Hester's finished end table with handmade cast bronze plumeria drawer pull.